The conduction system of the heart are the structures where the electrical stimulus, that allows the contraction of the heart, is generated and transmitted. Its main components are the sinoatrial node (sinus node), the atrioventricular node (AV node), the bundle of His and Purkinje fibers. In a normal beat, the electrical impulse is spontaneously generated by the sinus node, from where it spreads to both atria, causing the atrial contraction. Through preferential pathways the impulse reaches the AV node, where it is delayed, and then is transmitted to the bundle of His. Through the two branches of bundle of His, the electrical stimulus is spread to the entire myocardium by the Purkinje fibers. The first component of the conduction system is the sinoatrial node, also called sinus node or Keith and Flack node. The sinus node is a subepicardial structure, spindle-shaped, located between the superior vena cava and the right atrial appendage 1. Their cells have the capacity to spontaneously generate an electrical impulse around 100 times per minute, starting the electrical stimulation and controlling the heart rhythm. Therefore it is called the natural pacemaker of the heart. Related article: Sick sinus syndrome. It is believed by many that there are three preferential anatomic conduction pathways: anterior, middle and posterior internodal tracts. Moreover, the stimulus is transmitted to the left atrium by Bachmann's bundle, a branch of the anterior internodal tract, passing between the superior vena cava and the ascending aorta. It is the main activation pathway of the left atrium (not the only one). The following structure of the cardiac conduction system is the atrioventricular node, also called AV node or Aschoff-Tawara node. The AV node is located at the base of the atrial septum at the apex of the Koch’s triangle. Its main function is to transmit stimuli from the atria to the ventricles, because it is the only connection between the two structures (except if there is an accessory pathway) 2. The AV node has other important functions: Delays the electrical impulse (separating atrial and ventricular systoles), and limits the amount of stimuli which are conducted to the ventricles, preventing ventricular arrhythmias caused by the transmission of all impulses of atrial arrhythmias such as atrial fibrillation. The bundle of His is the continuation of the AV node which penetrates the central fibrous body. It has a common path that varies in each person, and then divides into two branches, the right branch and the left branch. Both branches run through the interventricular septum. The left branch is divided into two fascicles, the anterior and posterior left fascicles, extending from the base of both papillary muscles to the adjacent myocardium and ending in Purkinje fibers. Unlike the left branch, the right branch remains as a common bundle on the right side of the septum, dividing into small fascicles which continue with the Purkinje fibers. 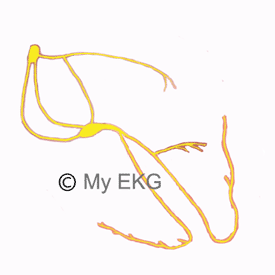 Related article: Bundle branch blocks. Purkinje fibers are the last component of cardiac conduction system. Are responsible for causing depolarization of both ventricles, transmitting electrical activation originated in sinus node. They are composed of specialized cells quickly lead electrical stimulation, and form a subendocardial network in both ventricles, ensuring simultaneous depolarization 3. The cardiac conduction system consists of structures that guarantee the generation and transmission of electrical impulses in the heart. The impulse is generated by the sinus node, in the upper region of the right atrium, and passed through preferential pathways to the AV node, located at the base of the right atrium. 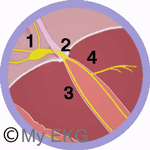 The AV node delays the stimulus before transmitting it to the bundle of His, allowing conduction to the ventricles. The bundle of His divides into two branches (right and left), and the left branch is divided into two fascicles (anterior and posterior). Right branch and left fascicles are continued in Purkinje fibers, responsible for causing depolarization and contraction of the ventricular myocardium. The electrocardiogram is the main tool to diagnose disorders of the conduction system. 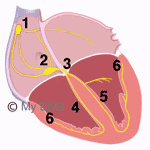 The best known are sick sinus syndrome, AV blocks and bundle branch blocks. Each of these disturbances has an article about them. 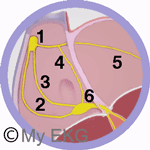 Check the sections of arrhythmias and bundle branch Blocks to expand your knowledge. 1. Vogler J, Breithardt G, Eckardt L. Bradyarrhythmias and Conduction Blocks. Rev Esp Cardiol. 2012;65:656-67. 2. Anderson RH, Yanni J, Boyett MR, et al. The anatomy of the cardiac conduction system. Clin Anat 2009; 22:99-113. 3. Sánchez-Quintana D, Ho SY. Anatomy of Cardiac Nodes and Atrioventricular Specialized Conduction System. Rev Esp Cardiol. 2003;56:1085-92.